As with all quality natural fiber carpets, vacuuming with a suction only vacuum cleaner is recommended. Beater bar vacuum cleaners may damage the surface pile of the product. Therefore, you want to use a vacuum without the beater bar attachment. Proper vacuuming on a regular basis will increase performance. 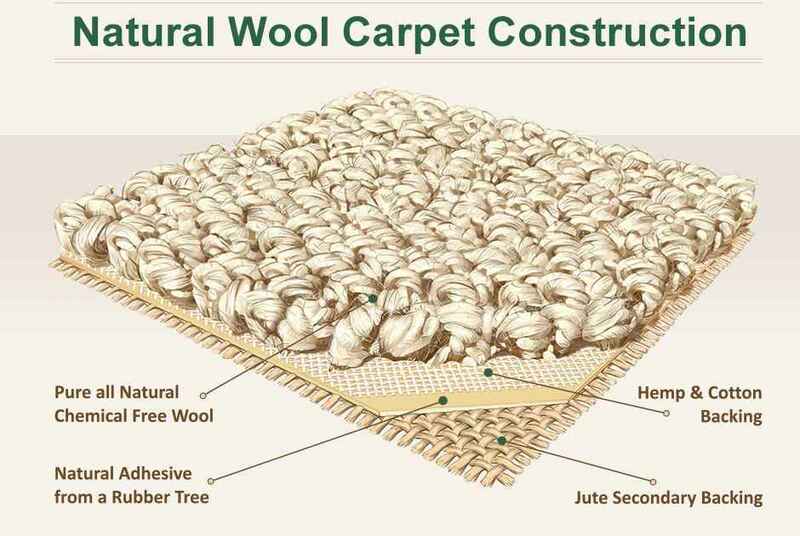 Wool can stain more easily than many synthetic carpets with chemical stain protections. Our wool carpets are free of these chemical treatments. Any obvious stains should be cleaned immediately. If you are unsure of what to do, play it safe and contact a reputable, professional cleaner for advice. Quickly blot up the mess without rubbing. Apply clean cold water to the stain to dilute it and blot gently with a clean white cloth. Dissolve a small quantity of mild cleaner such as a gentle soap, or approved wool cleaner in a bowl of lukewarm water. Test for color-fastness by applying the solution to a small area in an inconspicuous part of the rug. Dampen the stained area, working from the outside edges of the stain in. Then blot gently with a clean white cloth, turning it so that you use a dry area each time. Avoid rubbing. If the stain persists, repeat this step. Rinse and clean the area. Blot and fluff the pile until the area is dry to touch.